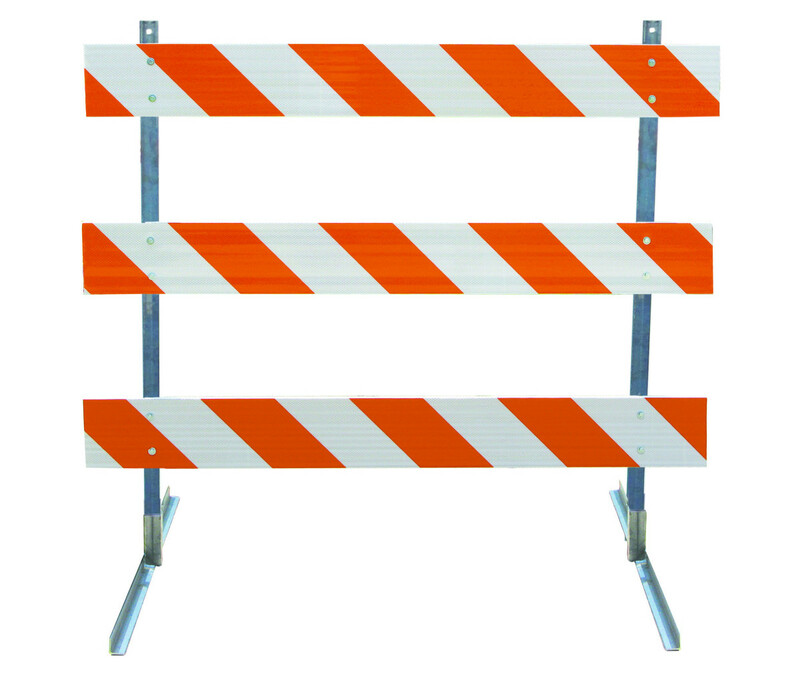 Type III Barricades, Traffic Barricades, 72" Type 3 Barricades and more from Trans Supply.com! Get these barricades as completely assembled units or as parts. Both the legs and boards can be purchased separately from each other. All parts can work with any of the type 3 barricades listed. The steel upright frame is hot rolled and composed of durable carbon. It stands by a 2” x 2” square tubing receiver. Base fastening can be permanent or short term due to the base design. Frame and base stay protected from powder coated enamel paint. If you need a more detailed spec sheet, please let us know! Prices listed above are for 1” thick boards, 2” thick board pricing is not online so please call for that info. Tightening problems are solved via end caps on the boards which give support. Board Thickness: 1.00" or 2.00"
Why are these called type 3's? Can you explain reflective sheeting to me and what the different options mean? Reflective sheeting or reflective tape is the orange and white stripes you see on the boards. They help give visibility to the barricades. There are three different kinds of reflective sheeting. Starting with the least reflective there is Engineer grade, Hi Intensity and Diamond grade. Do these accept barricade lights? Each unit can hold two barricade lights, yes. Can I specify which way I want the sheeting to point? Yes, just please tell us when you are placing the order. There is no extra charge. Do you make/sell barricade wider than 144”? We can make them wider than 144”, call for a custom quote. Would you suggest a wood or plastic type 3 barricade? Price wise they will come out the same because they have similar weights as well as similar per unit pricing. I would suggest plastic as that seems to be what the market has been preferring and what the majority of our orders are. When would I see them if I purchased today? Lead time depends on how many orders are in front and exactly what is ordered, so it is best to call to get a better idea. As far as transit time, expect 4-5 days to get to the East Coast and 1-3 days to get to the West Coast.